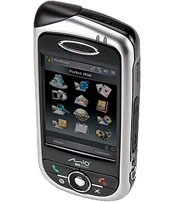 Mitac Mio A701 is a GPS enabled Pocket PC Phone based on a 520MHz Intel XScale PX-A270 processor, 128 MB of memory (64MB ROM), 2.7″ 65,000 color TFT LCD, 1.3 megapixel camera and runs Windows Mobile 5 aka ‘Magneto’. The GPS PDA phone is tri-band and supports GPRS, Bluetooth and has built-in GPS support for satellite navigation. Reg Hardware tested Mio A701 and gave the GPS enabled Windows Mobile score of 65% and concluded that” the Mio A701 disappointed me. I had high hopes that this was going to be a well integrated smart phone satnav solution, but it has too many little flaws. It’s by no means unusable, but it needs to be tweaked quite a bit before I’d consider buying one. As the Mio A701 is sold SIM-free it’s not going cheap, so expect to pay around £370 without the MioMap software and about £440 with the software included. You might be able to find it for less from some companies that offer it at a discount if you take out an airtime contract, but it will still cost you larger part of £200.